In the late 1800s, strongman shows hit the peak of their popularity in Europe and North America. As a way to demonstrate their might, a handful of strongmen included armwrestling exhibitions in their acts, often taking on all comers. Over the next fifty years, a number of these men were claimed to be unbeaten, and thus world champions. Unfortunately, very few of these men ever faced each other in a contest, so determining who the actual world champions were from this era is an exercise in speculation. It wasn’t until 1946 that the first well-documented contest to officially crown a “World Wrist Wrestling Champion” took place. 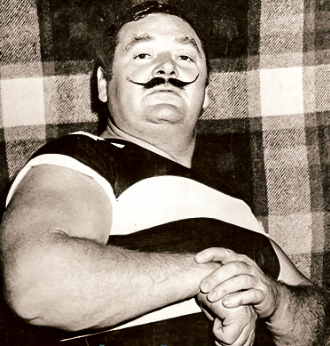 In the early 1930s, a Los Angeles tavern owner by the name of Ian “Mac” Batchelor began making a reputation for himself as being unbeatable at armwrestling. Night after night at his bar he would take on all comers, in any armwrestling style (stand-up/sit-down, arm/wrist wrestling) using either arm. As the word of his ability spread, more and more challengers came to see if they could beat him. None of them could. 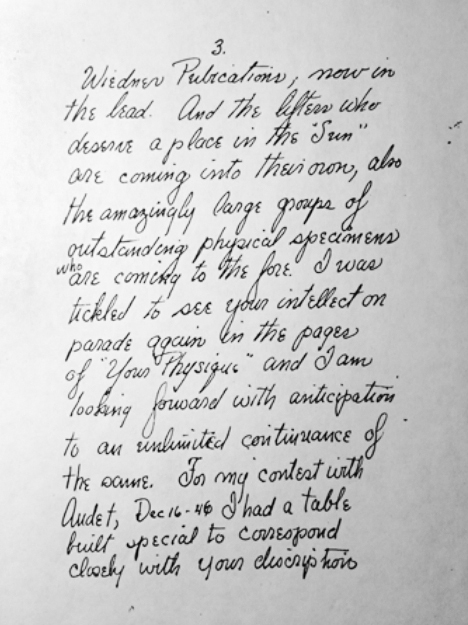 By the mid-1940s, another area man was developing a similar reputation. 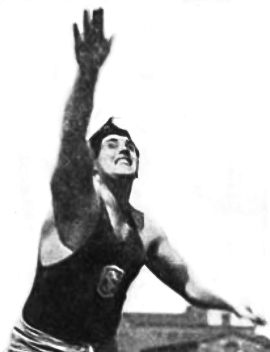 Earle Audet was a two-time national champion shot-putter as well as a professional football player (playing one season with the Washington Redskins and three seasons with the Los Angeles Dons). He was the best armwrestler on the Los Angeles Dons football team, and had never lost an armwrestling match to anyone. 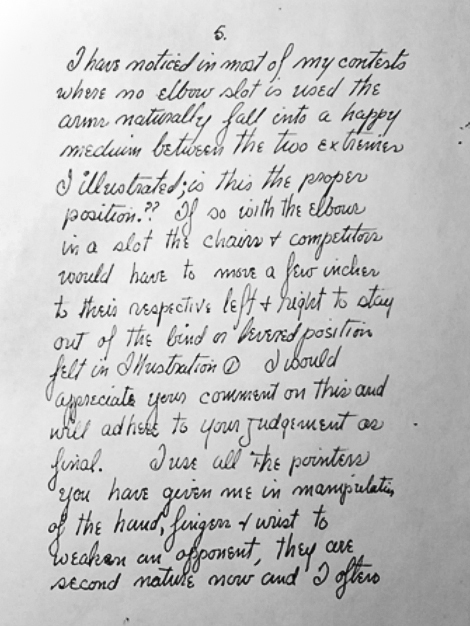 Upon hearing about Earle, Mac recognized an opportunity to promote a 2 out of 3 challenge match to officially crown a “World Wrist Wrestling Champion”, a challenge from which he would hopefully emerge the victor and in turn receive international recognition as being the sport’s king. Mac already had connections in the weightlifting/bodybuilding industry due to some of his strength exploits being covered in the muscle magazines of the era, which made arranging such a contest relatively easy. 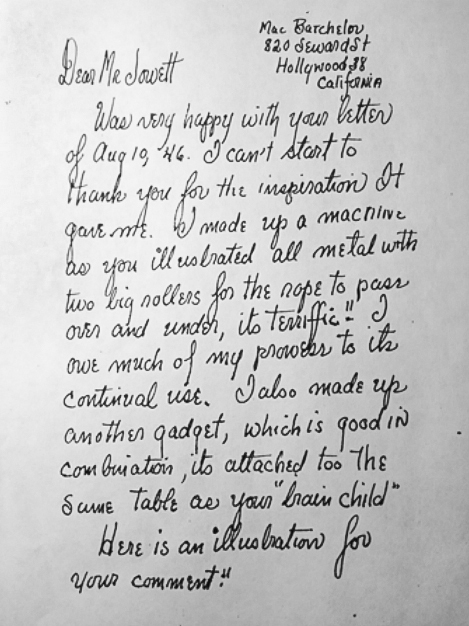 Mac built a table specifically for the contest under the guidance of George F. Jowett. George was a co-founder of the first weightlifiting association in the US: the American Continental Weight Lifting Association. He also participated in strength exhibitions, and was considered to be one of the top armwrestlers from the 1910-1930 period. He was perhaps the first person to actually train specifically for armwrestling, using a heavy spring. 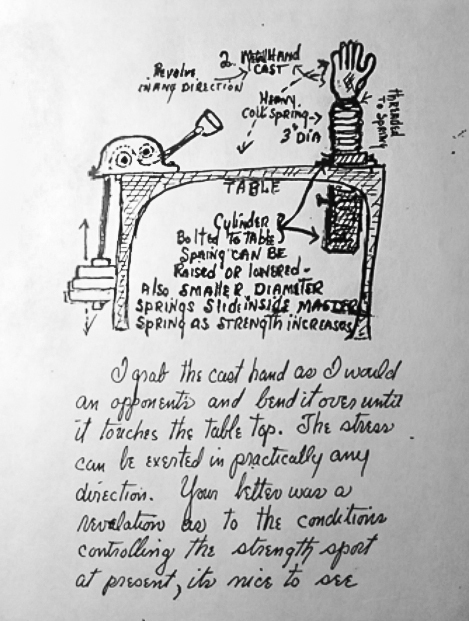 He placed a block of wood in one end of the spring to serve as a handle and fastened the other end to a bench. He would then try to force the handle down to the bench, using only forearm strength. When the exercise became too easy, he would simply replace the spring with a bigger one. 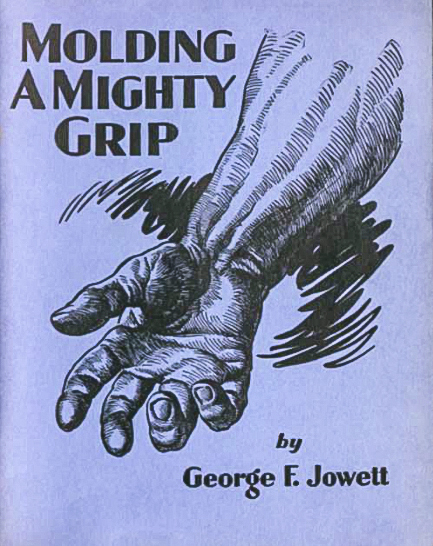 The first known published rules for armwrestling (or “wrist turning” as he called it) appeared in “Molding a Mighty Grip”, an instructional booklet George wrote in 1930. 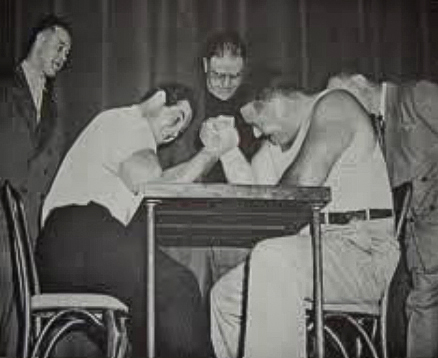 The armwrestling contest was part of a strength and bodybuilding show that was presented at the Embassy Auditorium in Los Angeles the evening of December 16th, 1946. The assembled crowd was excited to watch the historic event unfold. Both Mac and Earle had their share of fans, who were quite vocal in their support. Screams such as "Break off his arm! ", "Tear it loose!" were heard from both camps. Mac had the bigger reputation, and most expected he would win, but everyone wanted to see if the underdog could pull off an upset. Though Mac had the edge in weight (approximately 300 lbs to Earle’s 250), Earle had youth on his side (25 years to Mac’s 36). The contest was presided over by one official and two judges. 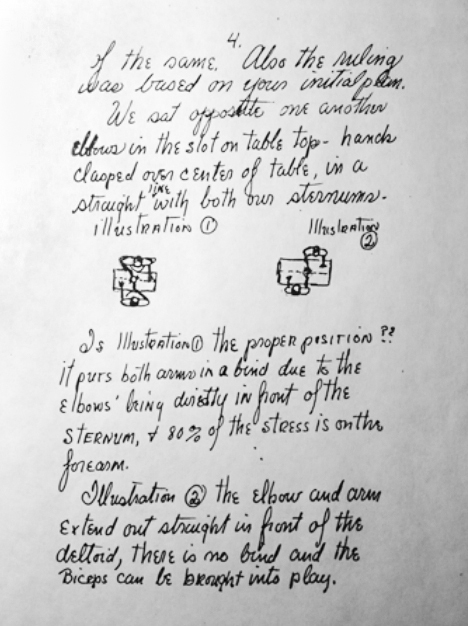 The competition was seated and non-competing arms (left) were laid flat on the table. Though called “wrist wrestling”, the non-competing hands were not clasped together as was later done in Petaluma. There were no pin pads, and a pin consisted of making the opponents hand touch the table top. 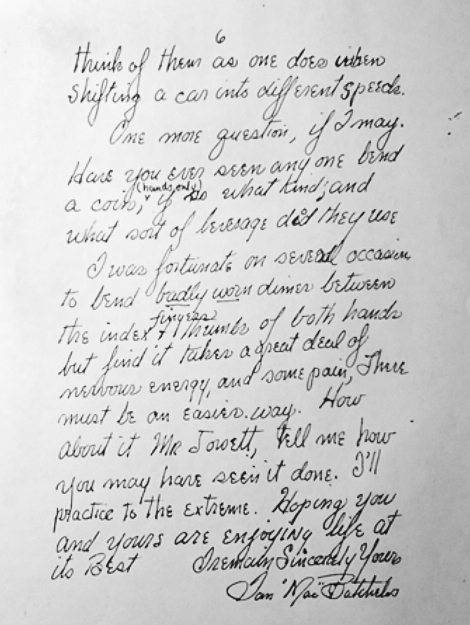 The superior technique was undoubtedly the result of Mac's experience, gained through thousands of armwrestling matches, as well as his correspondence with George Jowett, and his sport-specific training. By armwrestling standards, the match was quite long. It took Mac 29 seconds before he finally put Earle’s arm completely down. For the second match the competitors switched sides, but the result was nearly identical to the first, except two seconds shorter, with Mac winning in 27 seconds. It was now official, Mac was the “World’s Wrist Wrestling Champion”! The match was chronicled in Strength and Health Magazine, and along with the official designation of World Champion, even more people dropped by his tavern to try to beat him. Mac was happy to oblige, and pulled anyone who challenged him through to his official retirement from the sport in 1956, which was marked by the presentation of a special award at the Mr. USA contest. 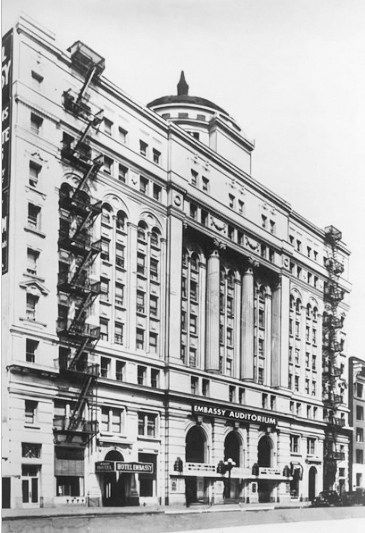 Between 1931 and 1956, Mac pulled and beat an estimated 4,000 different opponents without suffering a single loss – an incredible 25-year span at the top of the sport.